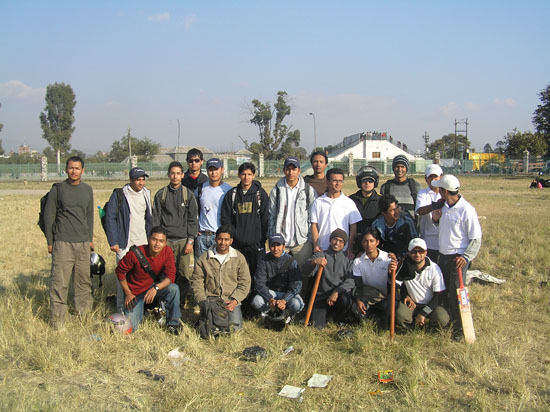 Sunday, 2nd Dec, marked a humble beginning in D2’s T20 cricketing history. 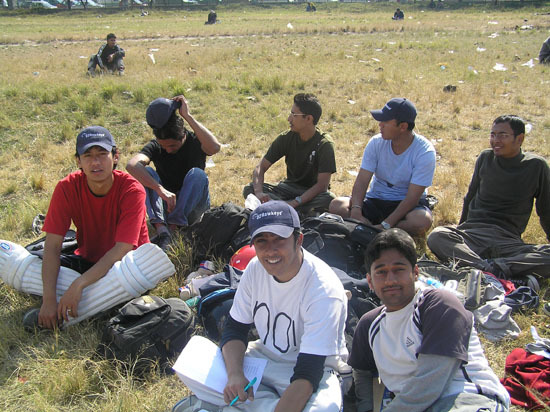 Our team, although rusty and unprepared, faced Javra Software in a friendly T20 match. 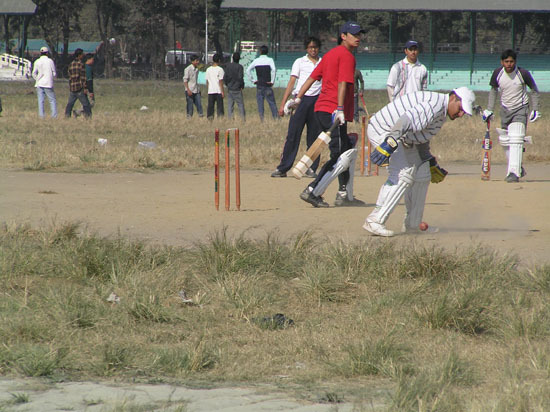 This 20 over a side game was held in openness of Tundikhel beneath the winter sun. 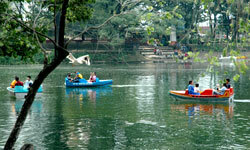 The match was schedule to start at 10AM but was delayed due to few technical requirements. The coin toss went up very well but unfortunately didn’t turn up the way we wanted. We lost the toss and had to field first. We started out with 10 aside match since a member in both the teams was late on the pitch. Nevertheless we started out well with Subodh and Ritesh steaming in to put in the first fiery spell. Our first breakthrough came through Sujan in second spell of bowling. This was a crucial breakthrough since Javra had both of their opening batsmen set in the crease. Sujan’s good bowling was rewarded with another wicket in his next over. We had a barren spell in the middle. This can be credited to the good batting by the opposing team’s opening batsman. He scored a half century with a towering straight six. D2 bounced back with good bowling performance towards the end. 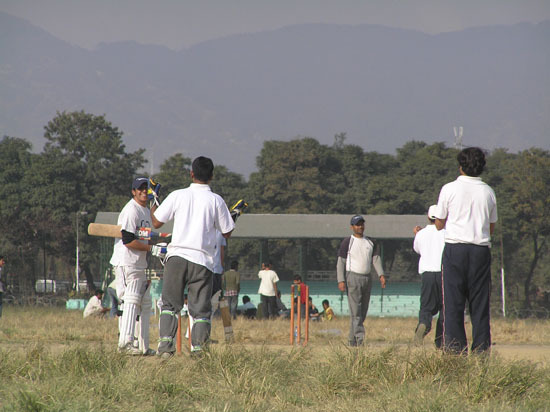 Sumit chipped in with a wicket and soon after Rejan claimed another. Ritesh was brought into the attack and rewarded the team by successfully uprooting stumps of the Javra’s most successful batsman. Our tight bowling allowed Javra to score runs in measly amount at the end. Subodh and Ritesh took a wicket each in the disciplined concluding spell. Javra managed to score 131 in their allotted 20 overs losing seven wickets. With a target of 132 in sight, we got the best start possible. Subodh and Sumit opened the batting for us with 15 runs coming off the very first over. We were off to a flyer. 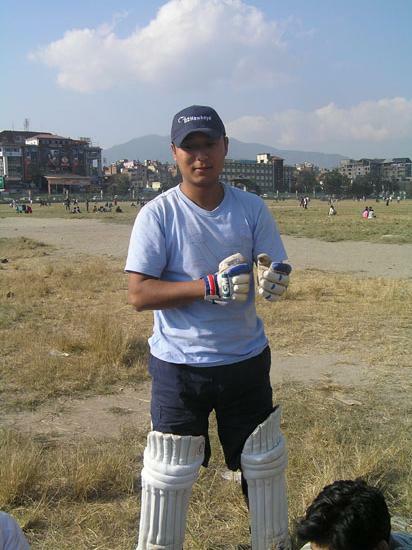 Having a left hander batsman, Subodh, proved to be a great advantage as Javra gave away a lot of runs through extras. The opening pair shuffling strike didn’t help the bowler either. 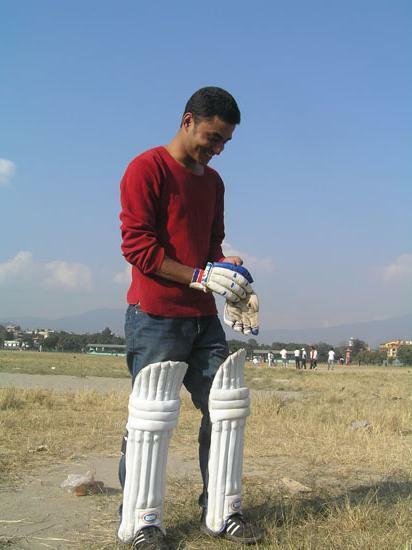 After a solid start, Subodh was the first batsman to return to the makeshift pavilion near the virtual boundary line. To our dismay, soon we lost another wicket. Javra started to hold a firm grip in the match by bowling well in the middle of the innings. Rejan steadied the innings by scoring 23 runs to keep our hopes alive. Sumit too played well before perishing at the score of 22. 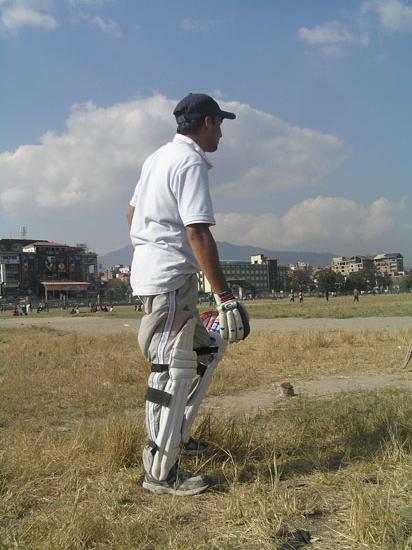 But after Rejan’s wicket, we kept on losing wickets regularly. But we kept on fighting till the end with Ritesh remaining unbeaten at 15. But in spite of everybody’s valiant effort, we were just 19 runs short at the end at cost of 9 wickets. We played as a team and managed to hold our heads high by putting on a good show! We didn’t loose, Javra was good on that day! Ashish heading to the crease. 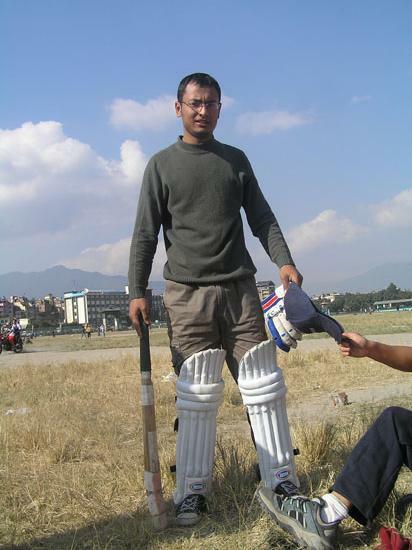 Finally I get to bat, jolly Nipun. 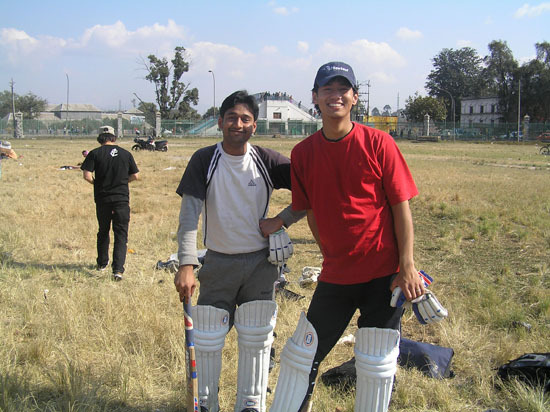 VC, Ritesh, having a chat with wicket keeper.